The Simpsons swap Springfield for Ireland in a new episode of the animated comedy which had its world premiere yesterday. ‘In The Name Of The Grandfather’, which sees the dysfunctional cartoon family go on holiday to the fictional village of Dunkilderry, will have its world network premiere on Sky1 in Ireland today for St Patrick's Day, a week ahead of the US transmission. 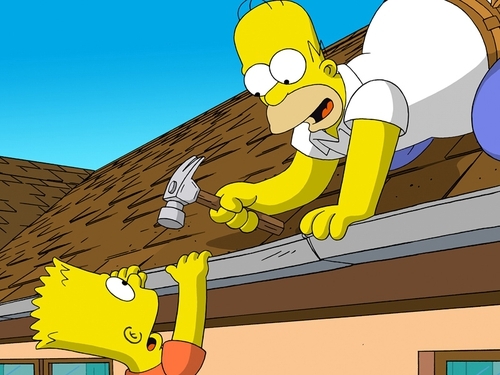 In the episode, Marge, Bart, Lisa and Maggie take in sights such as the Giant's Causeway and the Blarney Castle while Grampa shows Homer a pub he remembers from his youth. But visiting the watering hole he finds it has no customers, as the Irish are too busy working, and after a night drinking he and Homer agree to buy the pub. The show's executive producer, James L Brooks, said the tale was inspired by a newspaper article. "I read this article in the New York Times about the smoking ban and the fact that the pubs were closing. People were also working so hard and crunching hours to the point that the pubs were really suffering. It was based on these facts," he said after the premiere at Dublin's Light House cinema. He said: "I'm Irish American and I know Irish people have an excellent sense of humour so we weren't very worried. We wanted to do something very affectionate that was about us hearing about Ireland for years and we come over here and it isn't quite the way we imagined but it's still really nice."